Russian cars are so weird. But in a really interesting way. The “marque” is usually associated with a particular factory, in this case it is GAZ – which roughly translates to “Gorky Automobile Plant.” It is located in Nizhny Novgorod, which, coincidentally, will be the name of my first-born child. The Chaika (which kind of translates to “seagull”) was a car used by Soviet government officials – but not the really important ones (they got ZIL limousines). This was for your run-of-the-mill bureaucrats and field officers. You might be thinking “How is this a 1978? It looks like something from the mid-1950s.” Well you’d be right. After WWII, the U.S. government prodded Packard into licensing (or selling) their old body dies to the Soviet Union, presumably to appease them into not nuking us. Well Packard did just that but Packard also went out of business in the 1950s. 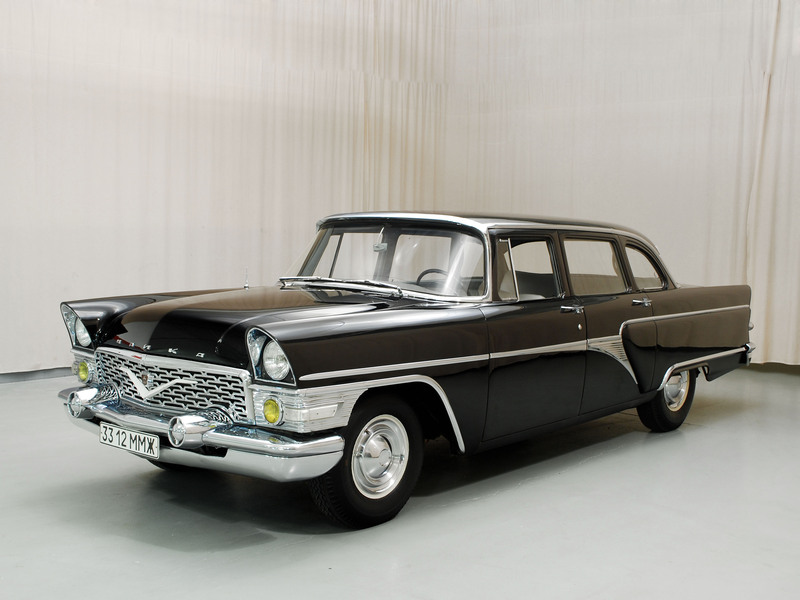 So the Chaika (Mark I or “M13”), which was produced from 1959 through 1981 was almost a direct copy of the 1955-1956 Packard Patrician, at least from the outside. The engine was a 195 horsepower 5.5-liter V8. It also used Russia’s first three-speed push-button automatic transmission (which was essentially copied from Chrysler). In 1977, the Chaika M14 was introduced and it was more of an original (and contemporary) design, at least for the time. Chaikas are really rare – anywhere in the world, especially in the U.S. They were not mass produced by American standards – or anybody’s standards, really. And their limited market ensured not many would be built. It’s really interesting and a piece of Cold War history. This one is in really good shape and can be yours for $69,500. For more information, click here. This entry was posted in Uncategorized and tagged 1978, cars, chaika, classic cars, for sale, gaz, hyman ltd by classiccarweekly. Bookmark the permalink.